Is a neighbourhood at risk of flooding during severe rain storms? Along what roads or portions of roads have property owners reported flooding during large rainfall events (July 8, 2013, August 19, 2005, May 12, 2000)? Is the area you are considering buying or renting in flood prone (so does the property of interest have flood risk mitigation measures in place, like a backflow valve to control sewer back-ups, or good lot drainage to keep runoff away from windows, doors and the foundation wall)? Residents and businesses have reported flood incidents to the City of Toronto after extreme storm events. Calls are made during a flood event or afterward, sometimes as part of an insurance claim related to property damage. The City's map is is shown below. As shown on the close up of the City's map below, only major roadways and points of reference are available, making it difficult to pinpoint a local area of interest. Unfortunately the City's map is not at a sufficient scale to show local streets with high historical flooding risk. As a further limitation, May 2000 flood report locations are only shown with a symbol (!) as the original City map did not embed Geographic Information System fonts in the exported PDF file. These symbols are off-set from the reported basement flooding location (red dots in the legend). Our Toronto Flood Map overcomes City map limitations and reveals high risk areas and neighbourhoods that have flooded during recent severe weather events. The City of Toronto is investing heavily in improvements to the sewer system to limit risks so some areas may no longer have the same risk after construction as they had in the past. Affected property owners may have invested in individual risk reduction measures (back-flow valves, sump pumps, improved lot grading, etc.) to protect their property from further damage. Not all flooding is reported so virtually any property along any street could experience flooding under certain conditions. For example, any property could experience flooding if the private sewer or drainage systems on the individual properties are not maintained (clogged foundation drains / weeping tiles, lateral service connection blocked with tree roots or other debris), or if there are other risk factors (reverse slope driveway, etc.). This explains some isolated flood locations. Because the high intensity area of a storm may cover only part of the city, the density of flood locations reflects the relatively higher local rain stress on the drainage system, and not necessarily the local drainage system capacity compared to other parts of the city. Other storms may affect parts of the City in a greater way (e.g., August 19, 2005 affected the north part of the City, while July 8, 2013 affected the west part). Individual addresses cannot be identified due to the scale of the map and spatial accuracy. Nonetheless, Toronto Flood Map can still show the relatively higher flood risk streets within a neighbourhood. Currently the map shows flood reports for the August 19, 2005 and May 12, 2000 storms. The May 12, 2000 basement flooding locations on the City's map have been corrected / adjusted so that affected streets can be identified. The July 8, 2013 storm flood report locations, available through other City reports, will be available shortly as will other historical reports reported through local studies. Can Twitter Accurately Document Flooding Incidents? 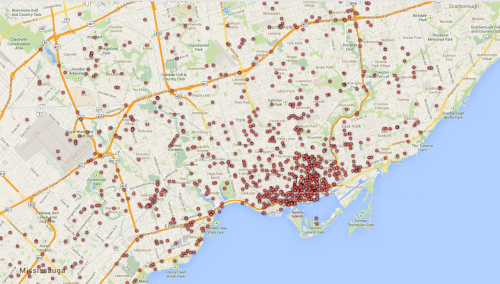 "To assist with the vetting and triage of insurance claims, BrightPlanet harvested all tweets within the Greater Toronto Area. BrightPlanet then filtered and curated the tweets down to only tweets discussing specific effects of the flooding. 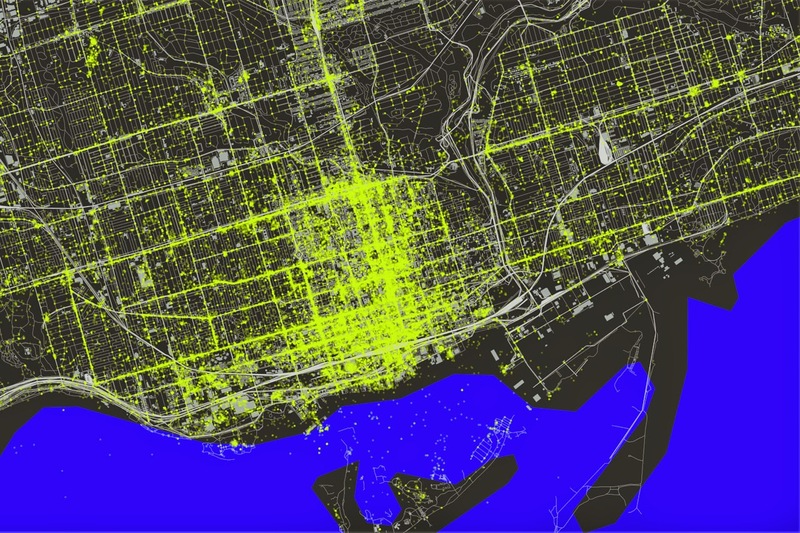 Any tweets containing a latitude and longitude were then mapped in a heat map format in Toronto to show where the most chatter was happening about the flooding." "The most densely Tweeted area is bounded by Bloor Street to the North and Lake Ontario to the South, connected by Young Street. There is a greater density along the Lake, away from Young to the West." Hot spots include the Eaton Center, Rogers Center and tourist and suburban destinations - the areas around Yonge and Bloor and Front Street, including the sports stadiums - "destinations for those interested in shopping or taking in the sights in Toronto." Areas that are strictly neighbourhoods (Hillsdale Avenue running east from Yonge) have low density. Tweet-rich downtown had only 50 mm of rain and limited reported flooding, compared to 130 mm of rain in tweet-poor Etobicoke where most of the flooding was reported. Perhaps the BrightPlanet flood tweets should first be "normalized" by the density of generic non-flood tweets, to give a better representation of relative spatial flood activity? 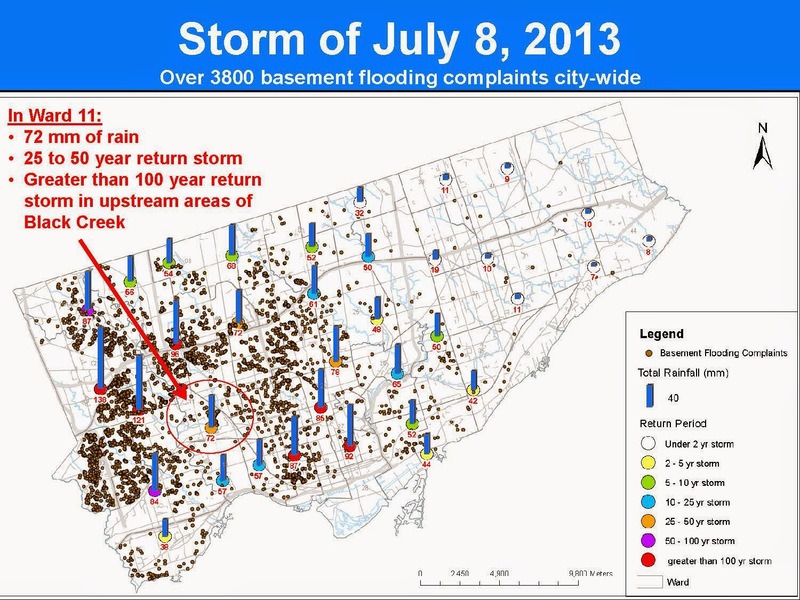 It would also be worth checking if what people tweet more about downtown is spectacular surface flooding (e.g., a sewer geyser blowing a manhole 10 feet in the air, a Ferrari floating in an underpass lake, an amphibious GO Train) as opposed to basement flooding, which is the focus of City of Toronto flood complaints. Tourist and passersby have time to tweet about flooding, while a homeowner with sewage gurgling up their basement floor drain may have more pressing thing to do (save the family photos honey! ).